Decumanus Green | Above All, Do No Harm! 18 Mar Above All, Do No Harm! We are currently doing weatherization work in a late 19th Century house in the Town of Lenox. This house presents all the usual problems of large, older homes, homes built with absolutely no regard for the cost of energy. The clients came to us complaining of severely cold, leaky spots in the floor, especially near the exterior walls. I knew it would be extremely challenging to stop the leaks and eliminate or at least reduce the cold spots. It proved to be even more challenging than I had imagined. The problem, as is often the case in these old houses, was the need to seal up leaks and seal in heat without subjecting the house to the collateral damage of unintended consequences. So, for example, as tempting as it was to insulate the entire basement wall and bring the conditioned envelope down to include the basement, the nature of the wall itself prevented us from doing so. Had we put the old stone wall entirely outside of the envelope, we would have risked frost heave damaging those walls. The exterior earth surrounding those walls is in the habit of absorbing heat from the basement space. This has kept it from freezing and heaving against the stone, thereby preserving the wall’s structural integrity. As much as we hate to see energy escaping from a house, we had to let this habit continue for the sake of preserving the very foundation of the house. We do plan to insulate the basement wall above grade. This will cover the coldest part of the wall yet will not affect its integrity. The rim joist area was another place where we had to exercise extreme caution so as to not do more harm than good. The original plan called for dense packing that area with cellulose. While this would have been an excellent solution for both air sealing and insulation, it would have been a possible disaster from a moisture management perspective. 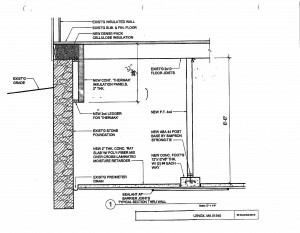 Our plan had always been to put a capillary break between the top of the stone wall and the cellulose; but once we opened things up, we realized that a significant amount of moisture was getting through the beam that functioned as the rim joist. It was not a tremendous amount of moisture; and in the past it had dried, probably to the inside during the heating season, with sufficient regularity so as to not create a problem. But given cellulose’s tendency to absorb water and block airflow, this drying process might have gotten interrupted by a dense packed cavity at the rim. What we elected to do instead was to air seal the rim joist cavity and then use Insul-Cube bags from National Fiber to make cellulose “pillows” that we then stuffed into the now-air-sealed cavities. We will go back to the house at regular intervals and take moisture readings to see if there is a problem. In those bays where moisture is a problem, we will pull out the cellulose “pillows” and replace them with mineral wool batts — a less effective insulation solution, but one that manages moisture much more effectively. The clients on this project have been great. They understand the complexity of what we are trying to accomplish and the uncertainty involved in determining the best path forward. They have expressed an eager willingness to try different things and see what works. In this patient and empirical way of moving forward, they will not only bring improvement to their home, but they will help to advance the knowledge bank of those of us in the weatherization community who are trying to preserve all these old houses, even as we try to improve their performance.